The antiserum was produced against synthesized phosphopeptide derived from human ATF-2 around the phosphorylation site of serine 62 or 44 (N-D-SP-V-I). 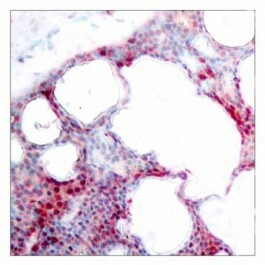 Suitable for use in Immunohistochemistry (1:50~1:100). Sakurai A, et al. (1991) Biochem Biophys Res Commun. 181(2): 629-635. Abdel-Hafiz H A, et al. (1992) Mol Endocrinol. 6: 2079-2089. Gupta S, et al. (1995) Science. 267: 389-393. ATF-2 (phospho-Ser62 or 44) antibody detects endogenous levels of ATF-2 only when phosphorylated at serine 62 or 44.